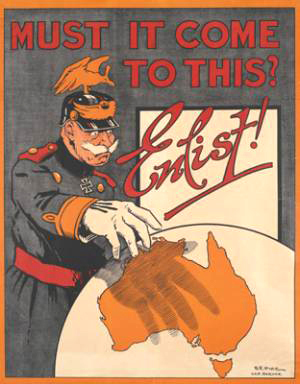 Australia throughout the war would remain the only army on either side made up solely of volunteers. A fact often overlooked, but interestingly raises more questions as to why so many men willingly volunteered. There is no doubt the initial response by Australians to the war was overwhelming and is often described as a patriotic fervor whereby men were falling over each other to enlist. Australians lived in splendid isolation, a great distance from the storm centres of Europe. They led a prosperous life and never had to fight for their national existence by the threat of war on their door step, and the prospect of an invasion by sea seemed unlikely. Twelve days after Australia declared it would stand by the side of Britain in the war against Germany, the 18th August 1914, men young and old started rolling in to enlist at Victoria Barracks, Sydney. At the same time all over Australia there was an intense interest in everything relating to the war. The various other states were equally making remarkable progress in the preparation of the expeditionary force. In all the states patriotic funds had been established and subscriptions were flowing liberally, while entertainment and fund-raising of all kinds was being organized to provide funds for the benefit of those who may suffer through the war. It seemed that everyday life was suddenly more exciting, patriotic fervor was growing around the nation, and even the sport of horse racing and hotels were enjoying the energy generated with higher than normal trade. The popular weekly sports column “The Turf” by Milroy in The Sydney Mail describes the events of the week.……………. 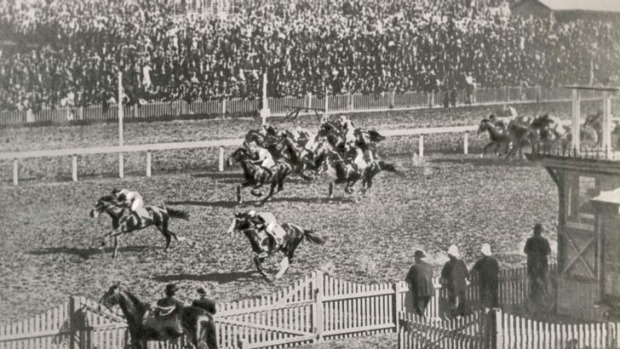 “It was feared a week ago that the war would wipe out racing for a time, or at any rate cause a serious falling-off in the sport , because of the depression of the money market, which would compel race promoters to lower the stakes, but this pessimism was apparently short-lived for there were fine attendances at both Rosehill and Kensington on Saturday, and money seemed as plentiful as ever while in the evening the stadium was packed with sportsmen. Returning from the stadium I walked from Paddington Town Hall to Bondi Junction and noticed that every Hotel was doing a Christmas business, while the streets were packed with joyous people. There are not a few hotels in that stretch of street. The prosperity of a back country town is invariably reckoned by the quantity of liquor it can consume and the number of hotels it can support. That is a sure barometer. So why did so many men volunteer ? For many it was an overwhelming sense of duty, a genuine concern for the nation’s safety. For others it was seen simply as “The Great Adventure” a chance to see the world and get paid at the same time. For some it was a chance to erase the past and start a new life and for others perhaps family obligations compelled them to volunteers. No doubt it was for all of these reasons and many more intriguing reasons which the men of the 1st FCE personal stories have captured. An important fact to remember is that thirty-five percent of the volunteers in the Australian Imperial Forces overall were British born, and many of them having parents and siblings still living in England, Scotland and Ireland. The obvious answer to the call for these men was simple, they naturally felt more British than Australian and their loyalty to home and the empire was overwhelming. It was perfectly natural for these men to volunteer as they rightly believed they had no choice but to protect England and therefore Australia from invasion. One such example was Sapper 184 Donald Clark a 29 mechanical engineer and a native of Glasgow Scotland. Donald felt it was the duty of all unmarried young men to enlist. Donald’s parents were deceased and he had migrated to Australia in 1912 with his sister Jessie. Donald now being the eldest sibling carried on the responsibility of being head of his family and took his role seriously. He describes in a letter to his younger brother Angus still in England, his circumstances and his reasons for volunteering. Donald explained that the pay was excellent at 6 shillings per day, of which one shilling per day was deferred pay and cannot be drawn until you were discharged. Donald was extremely reluctant to leave his sister, but as she agreed to his commitment to volunteer he left Jessie 40 pounds and had allocated 3 shillings per day for her to make sure she was comfortable in his absence and left two shillings to himself. Clearly Donald loved his sister and his sense of duty to his siblings and country was without question. Sapper 213 Roy Denning aged 26 from Naremburn, Sydney enlisted and stated he had no idea what a sapper was. One morning Roy was doing his usual routine and preparing for work as a carpenter at Clyde Engineering Works. Roy was a single man with a good job he had held for five years and within a few weeks of all the excitement of going to war he suddenly felt compelled to enlist. Now my chief worry was how I was going to break the news at home.” Source: “Anzac Digger” by Roy and Lorna Denning. 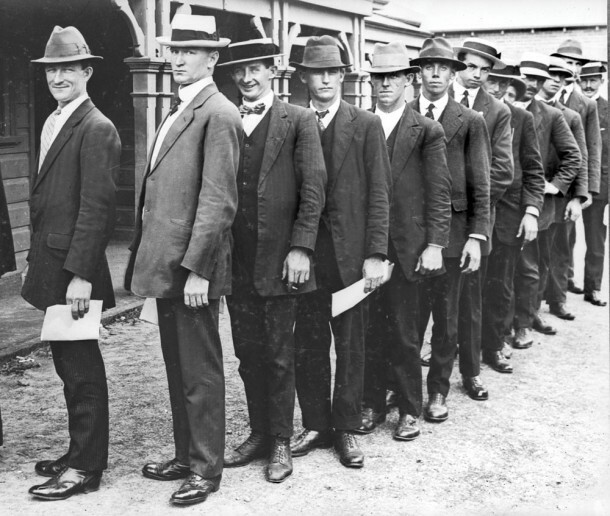 For some unemployed or lowly paid men, volunteering may have been a simple monetary decision. Times were tough for many large families, perhaps this was considered a possible quick fix to keep the family flush. While feeling duty bound to both family and country, to have their families compensated for their service was no doubt honourable and not such a bad thing in such difficult times. Research evidence of family feuding over money even after the death of a soldier, shines a very dim light on many families unfortunate circumstances during the war, and suggests for those involved, the basic needs to survive was unfortunately something that had to be considered above everything else. The grim reality is from the research on the 1st FCE alone which is a very small number of enlistments, I have seen a trail of disputes over money requests to the war office, from fathers, mothers, aunties, girlfriends, sisters and brothers, all claiming right to the assignment of payments entitled to the ANZAC on the field of battle. Many of the war service records have such letters from next of kin, relatives and so called next of kin making claims and requesting payments or preference for payments over another family member, so it was clear that the money was a very important, at least for some back in Australia. This seems inconceivable today, however this paperwork ping-pong at the base records office went on in the background for years, while the brave men were either laying helpless in a trench in Gallipoli, or perhaps laying dead in a desolate killing field in Belgium or France. In 1901 the state of New South Wales had created the Deserted Wives and Children’s Act (17/1901)….. It was created to ensure men supported their wives and children. Deserting a wife or child was made a criminal offence in the Crimes Act. 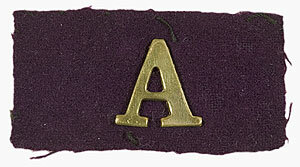 and initially this Act permitted orders to be made for the support of wives and/or children, an amendment in 1913 permitted the granting of legal custody of children to a wife when an order for support was being made and allowed men imprisoned for failing to pay support, to work while in jail. – Source NSW Legislation. Many men possibly saw enlistment as an opportunity to avoid the possibility of jail by becoming an alias and run away from a failing relationship, or a poor marriage. They considered it a chance for a new start in life, without the worry of past indiscretions or the failure to carry out their responsibilities. 159 Driver John Townley Thorman a 24 year old Locomotive Fireman was married to Leah Cohen a year before enlisting, but he attested to being single. Was he running away from an unhappy marriage and what were the circumstances which made him hide the fact he was married. His wife Leah however wasn’t standing by quietly waiting. A few months after John left Australia, Leah had tracked down John and presented herself with the necessary documents to the military offices at Victoria Barracks Sydney and had the pay office amend the N.O.K record in her favour. Similar circumstances for 28 Sapper Thomas Lytton whose real name was Thomas Appleyard. Thomas was a 30 years old a carpenter and enlisted as a single man born in Victoria. He had in fact been married for 3 years to Edith Hutton and had been living in Maylands, Western Australia. Thomas’s concerned wife, Edith must have suspected that he had enlisted and had reported him missing to police in all the states including New South Wales on January 20th 1915. She had no idea he had enlisted in the 1st FCE. She also had no idea that he was by this time in Egypt preparing for war. A previous criminal record or conviction was also sufficient to be refused enlistment. A simple solution was to change ones name and declare “NO” on the enlistment form to a previous conviction or criminal proceedings. A blemished past could be erased with a simple name change and a chance for a new start in life. Sapper 136 Alfred Taylor and his brothers grew up in the mean streets of Balmain and Surry Hills, and with his younger brother years earlier both were charged and jailed for theft and break and enter. Alfred’s real name was Alfred Tyley. Alfred a single man was determined to make a fresh start as Alfred Taylor. 148 Sapper James Dickson Spencer was not just the smallest man in the unit at 5ft 3”and 9 stone, but he was also desperate to reinvent himself and like many others, volunteering was just the opportunity. His real surname was Dickson not Spencer. He stated a different age on numerous occasions, stating he was 26 when he attested and then 22 when he later married a year later while on leave in England. So how old was he? James continued creating the smoke and mirrors routine to hide his past and really wanted to shake off any scent. Another change of identity was 67 Sapper Sedgwick Mansfield ‘s whose real name was Dudley Oaks. Dudley for some unknown reason used his two middle names on enlistment. A mystery waiting to be solved. It was common for good friends or workmates to also volunteer together. Good friends 71 Sapper James Scales and 74 Sapper James Pantlin and two tramway drivers from Sydney 336 William Girdler and 337 Joseph Fern both good friends, both in their mid 30’s and both married.….perhaps these mates considered this was the chance of a lifetime. Many “cocksure” young men were starting to talk about a paid holiday, see the world, and “shoot Fritz while we are at it”, to them that sounded like something a young man could get excited about. Perhaps it was the effects of the fear campaign. The impact of propaganda, the full force of the news in the newspapers and the recruitment posters that sent fear across the new nation, the fear of being invaded by the Hun, was this at all possible, the papers said it could happen, so it must have been true. There was nothing else to confirm what was going on in the world at that time except what you heard on the bush telegraph or what was read out aloud at the post office or by the butcher or grocer from a copy of the newspaper. There was no doubt any number of reasons the young and excited men from the cities and country areas were falling over each other to enlist, but I am certain we would all like to believe the vast majority felt it was their duty and loyalty to fight and preserve what the mother country had given them. Australia and its way of life was clearly worth fighting for, and for most this alone was a good enough reason to volunteer. 178 Driver Walter Joseph BLATTMAN may have felt this way, he was a 27 year old single father, a young widowed man with a son. Single men went easily enough but a young widowed man with a three year old son was unusual. Some volunteers came from a military family like 66 Sapper Norman Masters or had seen previous service in the Boar war like Sapper 93 Harry Farguson. Great stuff Vince. 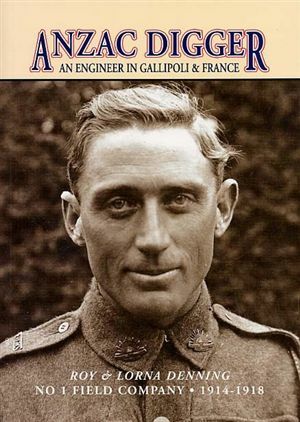 Looking for information re a cousin of mine killed at Gallipoli…….Leonard Gatty of the First Field Company of Engineers. KIA aged 18. Think he was killed on attack on German Officers Trench.